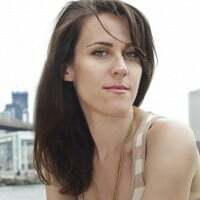 Julie Gueraseva is the founder of the NYC-based vegan lifestyle magazine LAIKA. Caryn Hartglass: I would like to just briefly talk a little bit about what’s been going on with me. As I mentioned earlier, we’ve been traveling around California, both last month and talking with Joe who’s been vegan for so long, it makes me think about the vegan restaurants and products that were available ten, 20, 30, 40 years ago when some of us were looking around for them. And I was recently at the Staff of Life market in Santa Cruz, and I used to go there in the ‘80s and ‘90s when I lived in California, and there was nowhere else to go for vegan food. And they had wonderful treats and desserts and sandwiches. It was always such a special place, and I was driving around Santa Cruz a few days ago, and I saw their new building that they moved to in 2011, and I went in and I was really delighted and surprised that I still felt this magical feeling in there. They just have a lovely atmosphere, and even though we’re fortunate enough to have so many more grocery stores, supermarkets that have wonderful vegan products today, I was glad to feel that there was still something special at the Staff of Life market. Okay, let us move to my next guest, Julie Gueraseva, the founder of LAIKA Magazine. Welcome to It’s All About Food, Julie. How are you? Julie Gueraseva: Hi, I’m great. Thank you so much for having me. Caryn Hartglass: You’re welcome. So I want to hear more about your vegan lifestyle magazine, LAIKA. It’s especially fun to talk to you now because I was just talking to Jo Stepaniak. I don’t know if you know of her, but she has created so many cookbooks and really created so much groundwork for many other cookbook authors and chefs to build upon. She had so many great cheesy recipes and saucy recipes decades ago, and I’m just seeing so many – so much evolution from her, so it’s kind of fun to talk about that. And now we’re talking to you, and you have this new great magazine and talking about all of the new vegan entrepreneurs and people that are out there moving this movement forward. Julie Gueraseva: Yeah, so LAIKA is essentially what you’re describing. It’s a showcase of the vibrancy and how relevant and contemporary the vegan movement is and the magazine, in particular LAIKA, what’s a little unique about it is that it has a really wide range of content. So there’s profiles of really compelling individuals within the vegan movement, celebrities who are very outspoken about being vegan like Kat Von D who’s on the cover of the newest issue, which is the 6th edition. So the magazine is young, but it’s now on its sixth issue, and then alongside of that, there’s very candid and unflinching, investigative stories, investigative journalism and reporting on animals, the situation they’re in and also the complexity of their lives. So it’s presenting animals in a whole new light, alongside human beings, so it’s showcasing the vegan lifestyle and its incredible range that includes food and travel and fun stuff like that, as well as activism, animal rights activism and the lives of animals. So it’s really showing the whole experience in a really immersive and compelling way that’s essentially what a mainstream magazine like Vanity Fair would do for human-interest stories as a whole. So it’s just – at the end of the day, it’s an interesting magazine with very inventive, engaging stories on a wide range of topics that just happen to be vegan, which to me, is the vegan experience in a nutshell. It’s full of interesting people who live interesting lives, who, in many ways, are just like everybody else, but it’s just that their lives happen to be – they happen to live their lives fully without relying in any way on the exploitation of animals. So it’s really a new kind of cutting edge model for living, which I think history of humankind is really pushing us towards as world events are showing. Caryn Hartglass: I love that. Let’s push more towards that. And the beauty in your magazine and about the vegan lifestyle is that there is no deprivation. We can have it all, and we can have more than it all. That’s how I feel about it. I’m continually telling people when it comes to the food. You don’t know how good you can feel. Julie Gueraseva: Yeah, exactly. In fact, I would say contrary to the stereotypes, it’s not a lifestyle deprivation. It’s a lifestyle of liberation, freedom because you’re widening your horizons and your experiences in ways you didn’t know existed before. After you untangle yourself from all these status quos that actually limit our experience on this planet as human beings, we’re constantly putting kind of restrictions on ourselves in many ways on how we interact with the rest of the world and being in touch with your feelings, which is also very stifling. As a vegan, you get to experience life fully and you’ll allow yourself to experience your full range of feelings as a human being, which includes compassion and empathy and kindness, all those basic human emotions that we’ve kind of denied ourselves. Caryn Hartglass: That’s really good. It’s almost – when we remove the toxic food and the food that’s coating our arteries and clogging our brain, physically we’re clearing, we’re detoxing, but it’s also a clearing and detoxing and a clarity giving experience for our emotions. Julie Gueraseva: Yeah, exactly. It’s a very multi-faceted experience. Caryn Hartglass: Right on! Go vegan! Period. Now you just have a few issues out. You’re new and I noticed in the seven years of doing this program every week, talking to many different wonderful people, I have learned so much. And I’m wondering what have you learned since you started this magazine? Julie Gueraseva: Oh my gosh, so much. I was actually thinking about that today is that as a result of doing the magazine, how much I’ve learned about everything from like animal sentience, the depth of their emotional world to cutting edge activism techniques to how to approach talking to people about veganism, about the vegan movement in different parts of the world, what’s happen. It’s sort of like I really intentionally go into material for each issue that is also new to me because I want to learn new stuff. And with every issue, I’m just astounded by the wealth of information that is just – it’s so just enriching and just gorgeous information that I come across. Like discovering that there’s a vegan scene in central and Eastern Europe and Prague and Warsaw that’s really dynamic, and they do interesting things there with their animal rights organizations that we might not be doing here. So the magazine is also a really intentional kind of vehicle for cross-pollination of ideas and experiences so that someone – it has an international – it’s available internationally. It has an international readership, and it’s content, although primarily dealing with topics, stories dealing in the United States, there’s also tons of stuff from other parts of the world. So it’s really bringing together the global vegan experience, which is really fascinating. Julie Gueraseva: Oh yeah, oh yeah. That’s a great book. Caryn Hartglass: It’s such a great book, and I especially love the way he wrote it because I think it’s very approachable, very appealing to even those people who are fish eaters. They’re just lovely, amazing stories, but then I hope those that read it can make the leap. Fish are your friends, not food, everybody. Julie Gueraseva: Yeah, and that’s what I try to do is every animal related feature in LAIKA, I really aim to kind of humanize animals like there’s a story in the new issue called Enduring Bond that’s all about really close friendships between animals, and I deliberately brought together stories from a multitude of sanctuaries from around the world. There’s two international sanctuaries and five from all over the United States, and it’s just mind-blowing the types of stories and the photographs that show the closeness that these animals experience that is so much like the human experience that you read that, you see that and you read those stories, which show the process of animals bonding; how they get to know each other; how they kind of gravitate towards certain kinds of animals like they click with some, they don’t click with others, just like people do. They grieve over loss in a very overt way, just like human beings. So our experiences, we have so many commonalties, which is what the theme of the new issue is, which is the unity issue, which explores the commonalities between human beings and between us and the animal kingdom and planet Earth and the importance of being unified. Caryn Hartglass: Unity is a great concept right now. As humans, we’re still struggling unifying with our own species. We’re struggling with borders around countries. We all share the same home, planet Earth. We all breathe the same air, drink the same water, and yet we’re still struggling with being unified within ourselves. This refugee crisis, the Brexit, the vote that just happened. We need unity. Julie Gueraseva: Yeah, so that was sort of – it was a very organic kind of result from – resulted from just living, seeing what’s happening around the world, and also as a vegan movement, it’s so important to be unified. And I think really the core of unity is just really honing in our commonalties. The most important things that tie us together. We all share the same values at the end of the day, and those same values are important to animals, like happiness, feeling safe. Safe from harm, enjoying your surroundings, valuing freedom. Those very basic needs without which we can’t live and which we all need. That’s what unites us, and we can provide that for each other just by simply respecting one another. So it’s really about kind of striving for coexistence, which I think is the only way we’re going to all survive on this planet. It’s the only way our planet is going to survive is if we learn to coexist. So I think it’s really important to put this kind of – those kinds of messages out there. This is my way of doing it with the magazine and we can all do it every single day. Julie Gueraseva: Yeah, you know, it’s a complex thing, and there’s a multitude of approaches. I really believe in a diversity of tactics, and I believe in kind of disarming people with kindness and listening to them. Try and understand them because people get so defensive. I mean food is probably the most personal, the most controversial topic, possibly one of the most controversial for sure, ever. People take it very personally. They see it as like a personal freedom, but if we take a step back and we just recognize that these are just society’s status quos and social norms that have been imposed on people that are not necessary. We just kind of deconstruct the situation, then it becomes a little easier to manage so that if someone is coming at you with the bacon jokes, you kind of realize, well, they’re still under that state of kind of not seeing clearly and subscribing to these outdated status quos. But this is where I come in and I help them to come out of that, and that’s another thing I’ve learned through the magazine is just different techniques and different approaches. There’s so many different ways to handle it, but I really have so much – I’m just an optimist by nature but also because of my background, I was born in Russia. I grew up still under the Communist – when the Communist regime was still intact, and I lived through that system falling apart. So I saw with my own eyes a whole regime that was so ingrained in society just come tumbling down. And now that I’m vegan and having been vegan for about eight years and everything I’ve learned, I think back on that and I realize anything is possible. You think it seems farfetched. Don’t assume that it’s not possible, so I don’t underestimate anybody. I believe that most people are capable of seeing the light, so to speak. It’s just that some require a different approach. There are different approaches. I’m thinking more of like let’s get to the tipping point. Let’s go to that ten percent, and after that, I think momentum will really take over. Caryn Hartglass: Western something. Anyway, we have so many conveniences. People don’t want to give up conveniences. They don’t want to change, and when they begin to see that they can have it all, as I mentioned before, and it’s easy and they don’t have to change very much, then they’ll go for it naturally. Caryn Hartglass: Okay, so the newest issue, where can people find it? Julie Gueraseva: So people can get it at LAIKAMagazine.com online, and then it’s going to be available in about a week, a week to ten days on newsstands around the country and internationally and various independent bookstores. So they can just check the site and check various social media pages that the magazine has. On Instagram, the handle is LAIKAMagazine and Twitter and Facebook, it’s Facebook.com/LAIKAMagazine to keep up with the latest stuff. We’re going to be putting out more exclusive behind-the-scenes videos from our cover shoot and other fun stuff. Yeah, I’m really proud of this issue. I think it’s really inspiring and uplifting. It’s really going to move people and move them to action. Caryn Hartglass: Great, and can you tell us a little bit more of some of the features that are in this magazine that you didn’t mention earlier? Julie Gueraseva: Yeah. Yeah, absolutely. So there’s the feature with Kat Von D. She’s the vegan tattoo artist, and she a cruelty-free makeup line that she’s making vegan. And we photographed her at Farm Sanctuary, so she’s with all these beautiful rescued animals. It’s a really beautiful story, a really inspiring story. And there are travel stories on Prague, Warsaw and Vancouver. There’s a feature on coyotes, foxes and wolves. There’s sentience and how they’re persecuted unfairly, even though many people don’t realize they’re actually cousins of the domestic dog. There’s a really awesome feature that I love about – that’s a series of conversations between vegans from different generations, vegan trailblazers like Marc Bekoff and vegan teens. So they exchange really interesting perspectives and ideas on vegan history and vegan future. It’s just another – it ties in with the unity issue and another example of cross-pollinating ideas. I think it’s really important to get the perspective of different generations. There are really beautiful food stories. There’s a really beautiful food story that’s really kind of – it ties in also with the unity theme, that’s really vegetable forward and inspired by the bounty of the planet kingdom. There’s a really wonderful interview with activist Marc Ching, who is fighting the dog meat trade in Asia. You may have heard. There’s a really poignant interview with him and a feature on Tony Kanal who’s the bassist for No Doubt. He’s a vegan musician and activist. Caryn Hartglass: Julie, that sounds great. I’m very excited to hear about it, and we’re out of time. So thanks for joining me so much and the best of luck with LAIKA Magazine. Julie. Julie Gueraseva: Thank you so much for having me. Caryn Hartglass: Okay, you’re welcome. That was Julie Gueraseva. Be well and I’m Caryn Hartglass. You’ve been listening to It’s All About Food. I just wanted to mention before we go, at ResponsibleEatingAndLiving.com, my non-profit, we just hit day 500 of our daily blog, What Vegans Eat. So I hope you’re reading it, enjoying it and we post every day what we eat here in my family at Responsible Eating and Living. Recipes and ideas for you. Hope you’re enjoying it. Thanks for joining me. I’m Caryn Hartglass and remember, tune in live here at Progressive Radio Network. Tuning in love and have a delicious week. Transcribed by Alison Rutledge, 8/6/2016.